Central London is experiencing an exciting phase of regeneration in the form of the Elephant Park project in Elephant & Castle. One of the emerging neighbourhoods this will create is Highwood Gardens, with a mixture of homes, amenities and retail spaces linked by a one storey podium. The community will benefit from the central hub of the West Grove Club, providing an around the clock concierge service as well as a gym, lounge and café, all linked to a shared courtyard area. The 104 metre tall Highwood Tower represents the tallest structure in the development and one of the cornerstones of this masterplan, rising 31 storeys and providing the area with 222 sustainable new homes, so a reliable and highly functional facade access solution will play a vital role in its success. The building design by architects Alford Hall Monaghan Morris presents an attractive facade made up of anodised aluminium unitised panels. Deep fins made of natural anodised aluminium provide an arresting architectural feature and also a framework for the building. Another key feature is the pergola which forms a crown at roof level to achieve a lighter, more open quality to the tower as a whole. 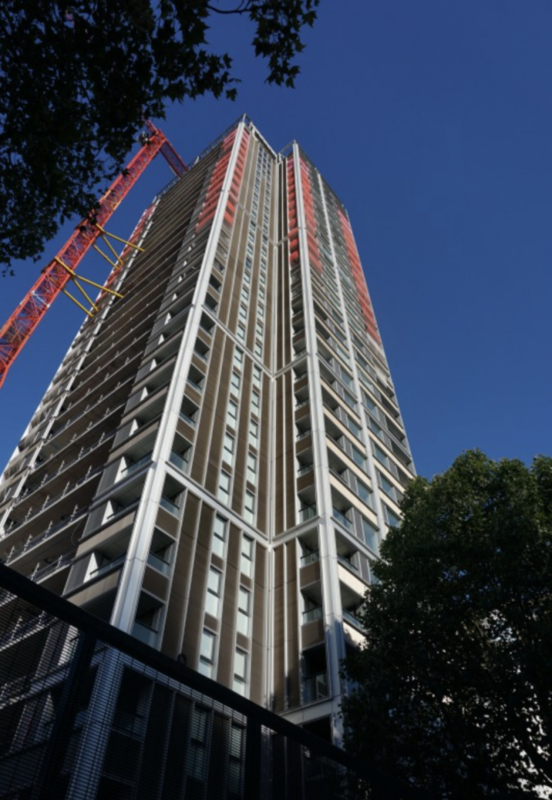 The project therefore called for a building access solution capable of servicing the entire facade surface, including the ability to navigate around the crown structure to provide safe cleaning and maintenance access to the highest floors. The CoxGomyl team proved their ability to meet the particular challenges this project presented and delivered a comprehensive building maintenance system for reliable and practical facade access. A single Building Maintenance Unit is located at roof level and travels on a track mounted around the perimeter in order to provide complete facade access to every side of the tower from the roof down to ground level. The Building Maintenance Unit offers high functionality with a telescopic roof trolley in combination with a jib which provides luffing and slewing movement. The specific challenge of the crown feature created an additional requirement for the cradle to be capable of providing building access between the structural columns. The cradle also had to be compact enough to be lowered between the building’s beams while still delivering all the functionality required of high-quality building maintenance systems. An essential part of achieving a practical and comprehensive facade access solution within these challenging parameters was the 3D building interface modelling which CoxGomyl were able to provide. This was an indispensable step in the process which was necessary to calculate and visualise the operation of the Building Maintenance Unit and ensure it would function smoothly within the confines of the clearances around the building perimeter. As this new community grows and develops around Highwood Tower, the reliable and practical building maintenance systems put in place by CoxGomyl will provide for the maintenance of the important facade and building features to keep the building pristine for many years into the future.